The polluted Atlas Tack Superfund site was transformed into vibrant coastal habitat. 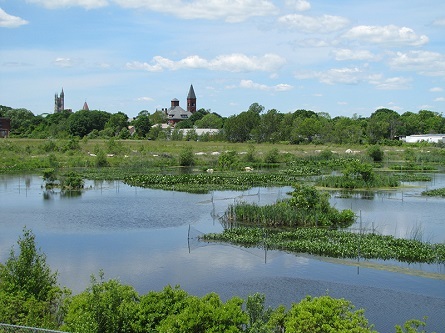 Here, you can see the new freshwater marsh with the town of Fairhaven, Mass., in the background. When conducting a Natural Resource Damage AssessmentInvestigation performed by trustees to identify injuries to natural resources caused by oil spills, hazardous substance releases, and grounding incidents in National Marine Sanctuaries, and plan restoration activities. The goal of NRDA is to restore natural resources and compensate the public for lost recreational use., we often determine the amount of restoration required through a process called service-to-service scaling. We calculate the services lost from a natural resource injury, and develop restoration alternatives that will provide the same amount of services to the public. This approach directly scales restoration projects to replace the services that were lost. Unlike valuation methods, service-to-service scaling does not require quantification of lost services in monetary terms. In order to determine how much restoration is required to compensate for habitat injuries, we may conduct a Habitat Equivalency Analysis (HEA). This method assumes that equivalent habitats will provide equivalent services, meaning that years of lost services can be compensated for by providing acres of additional habitat. The basic unit of measurement for this approach is typically a discounted-service-acre-year (DSAY). A DSAY represents the value of all of the ecosystem services provided by one acre of the habitat in one year. Services for future years are discounted, placing a lower value on benefits that will take longer to accrue. Therefore, additional acres of habitat must be restored when restoration is delayed. Once the DSAYs are calculated for the injured habitat, restoration projects are selected that would adequately offset these DSAYs in the form of acres of restored habitat. When a pollution incident has significant effects on particular animal or plant populations, we may conduct a Resource Equivalency Analysis (REA). For example, consider an oil spill that kills a large number of ducks. Using information such as life expectancy and reproduction rate, we can estimate the “lost duck-years” due to the spill. We can then design restoration projects to restore or create duck habitat, scaling the size of the project so that it will fully compensate for the duck-years lost in the incident. As in a HEA, we always apply a discount rate to future years in a REA, so that additional restoration is required the longer that recovery is delayed.